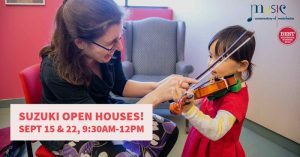 The Music Conservatory of Westchester’s Suzuki program offers instruction in violin, cello or piano for students ages 4 and up focusing on the philosophy that “Every Child Can” learn to play an instrument. Suzuki approach is based on an equal triangle of support and cooperation between the student, teacher, and parents. Our highly qualified Suzuki teachers train young musicians to become skilled instrumentalists, performers and ensemble players, while developing their motor skills and focusing ability.